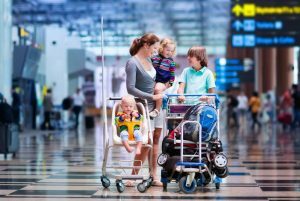 As the holidays draw closer, many nannies will prepare to travel with their employers on holiday, sometimes for long periods of time. If you haven’t worked as a holiday nanny before, it can be an exciting experience. The promise of exotic and distant lands is tempting, for sure, but it can be a strain on your employer-nanny relationship. Firstly, set up a meeting with your employers to discuss the holiday. What are the parent’s expectations? Are you going to be sharing care of the children or are you going to work sole-charge, while parents are away from the resort? What will your working hours be? Even if you don’t babysit during your normal working week, you may be expected to stay in some of the nights to look after the children. Clarify this with your employer, that your time away isn’t part of your holiday allowance. This is a no-brainer, but some employers may see it this way. It is likely that you will be working longer hours than in a normal week, it is important you come to an agreement with your employer regarding your rate of pay. While you understand that you are here working, you may want to enjoy the scenery in your own time as well! Don’t be afraid to ask if you will be entitled to any time off, if so, how many days/nights? Remember you are here to look after the children for the most part, but it is essential that you and your employer understand that you may be deserving of a night off here and there! Traveling to a new destination is exhilarating, so why not enjoy the weather, atmosphere and culture of the country you travel to. Will they expense your travel to and from the airport if you travel separately from your family? On the odd chance you aren’t able to travel with your nanny family, travelling expenses to and from the airport can be expensive. Make sure you ask whether your travel arrangements will be paid for. Are you going to be paid your usual rate, for the time you spend traveling to the destination? While you see the day of travel as a usual working day, a few employers may use this as an excuse not to pay you for the time you spend traveling to the destination. It is best to clarify this before you leave, so your employer is aware that this will be a normal working day, at the same rate of pay. Ask about the sleeping arrangements. Are you going to have a separate room? Or are you expected to share a room with the children, or another member of staff, coming along on the holiday? Will the employer pay for your travel insurance or do you need to make your own arrangements? It is up to you, how flexible you want to be with any of the points above, we all have different expectations of our jobs. Draw up a Holiday contract and make sure that it includes all that you have discussed. And lastly, anything can happen on holiday, so be prepared!